Download it to learn how enterprises are deciding on IaaS providers and what is setting the leaders apart. The range of players competing in the market for providing cloud services are using a broad set of different types of business models and represent a wide spectrum of different types of brands, according to IDC. But what are today’s enterprise’s top buying choices and why? 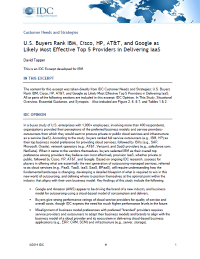 This IDC study excerpt provides the results of a buyer/demand-side survey of U.S. enterprises with 1,000+ employees, involving more than 400 respondents, on their perceptions of the preferred business models and service providers–outsourcers from which they would want to procure private or public cloud & IaaS.